Hi. I've been trying to program a ballistic wounding simulator for a game, and I've made some good progress modeling the body and the damage of bullets. A problem I've encountered, is to properly simulate hollow-point injuries in the game I'd need to know the curving rate of a bullet's deformation. The problem is, this information is not freely available anywhere I can find, so the only way to get this data seems to be to reverse engineer it from test results. I apologize for the uneven chart. The code tags are not responding the same way my TXT file does. I believe there is enough data here to reverse engineer the rate of penetration. The issue is that I don't know what formulas to use to get the information. There is a selection of different variables that come into play here, and it does not seem easy to work out the answer. Energy: The bullet loses energy as it travels through the media (in this case, ballistic gel). However, the more expanded the bullet is, the more resistance it will face and the faster it will lose energy. Note how the temporary stretch cavity gets less and less, as the bullet loses energy. The permanent cavity also narrows slightly, but I don't need data on that feature (to save you time). The less energy the bullet has, the less effective bullet deformation will be at creating large cavities. 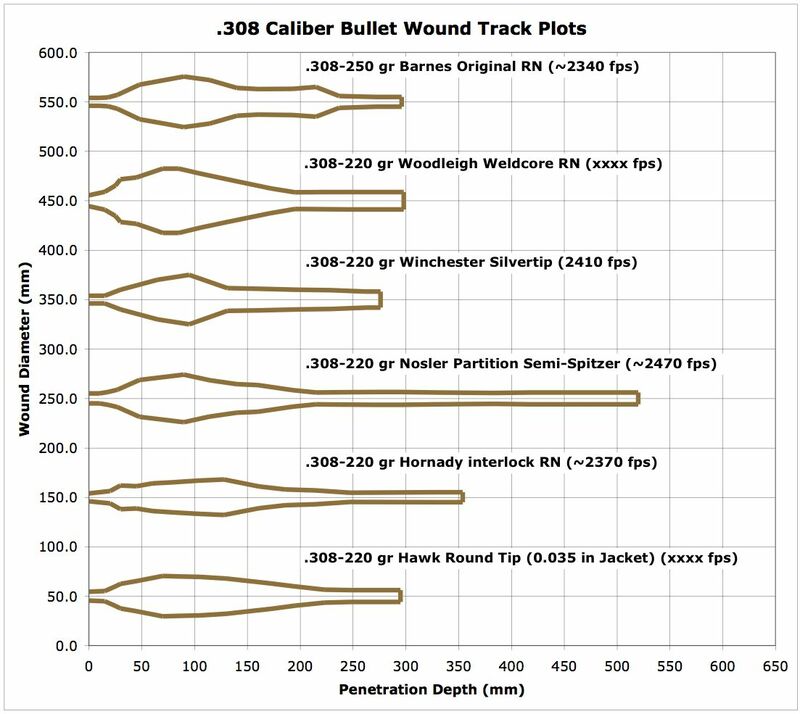 The size of the permanent wound path is similar to the diameter of the bullet. If the bullet is expanded, it will have a wider diameter and a wider wound channel. Deformation: Now here's the trickiest part. Different bullets expand at different times, in different ways, at different speeds, producing dramatically different curves. When a bullet deforms, a massive amount of energy is put into the ballistic gel and it can form huge cavities--if the bullet still has a lot of energy. Handgun rounds don't have enough energy to produce large permanent cavities, so we're mainly looking at .308 rifle rounds. Is there any way to estimate the curve of deformation for such bullets, without tens of hours of work? If this problem is too difficult for the skilled mathematicians and enthusiasts here, I expect I am completely out of luck for finding out the rate of deformation for these bullets, in my game. Thank you for reading and taking interest, and for any advice you can give me.